The interplay of darkness and light distinguishes this three-part graphic narrative that probes the seamier recesses of the American soul. The alliterative subtitle provides an apt description of the contents of this historical volume from award-winning artist Sturm (Unstable Molecules, 2003). The “God” section, titled “The Revival,” launches the narrative in the frontier of the early 1800s, when Missouri and Ohio were still the untamed West, and pilgrims proceeded through a wilderness of sin for the promise of salvation. It’s hard to sustain the faith amid the drinking, gambling and rampant fornication, with God’s absence felt more strongly than his presence. Meanwhile, the “Gold” section takes place “Hundreds of Feet Below Daylight,” which provides metaphoric resonance as well as a literal description of a hellhole mine marked by greed and betrayal. The narrative then flashes forward to the 1920s with “The Golem’s Mighty Swing,” the longest and most ambitious of the chapters and the one that finally allows some daylight. Here, the ethnic divisiveness that has been simmering through the earlier chapters comes to a boil, as the barnstorming Stars of David baseball team (“The Bearded Wandering Wonders”) experiences ridicule and hostility as its novelty value packs parks across the country. The Jewish squad features an African-American ringer, transformed into “the Golem” by an unscrupulous promoter. 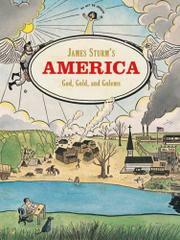 Sturm captures the essence of the country as reflected in the all-American pastime. It doesn’t take many words or strokes for Sturm’s graphic artistry to leave a lasting impression.